Stuttering therapy can cause anxiety and frustration for everyone! For you, it may increase your heart rate just thinking “How do I do this effectively and not cause emotional harm to this child?” For your students, it may just be overwhelming and frustrating. 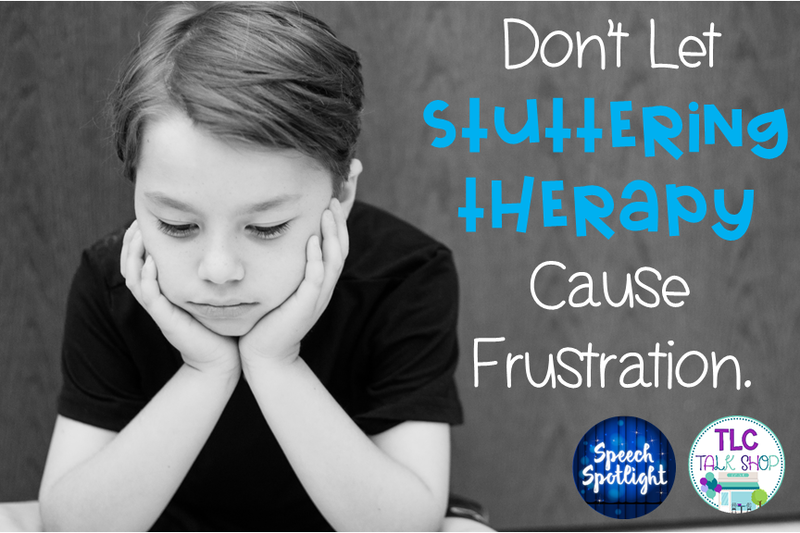 Why does stuttering therapy cause this reaction in all of us? It is because there is no cure for stuttering. Stuttering therapy is a lot of work for everyone involved but especially for the kids. Families are looking to you to cure it and you have to explain that it is a battle that will need to be fought daily. Since we are able to fix articulation errors, increase and build language skills, and teach non-verbal children to communicate using pictures or devices, it is increasingly frustrating that we can not completely “clear up” stuttering or make the battle easier for our children. Plus, stuttering often impacts our children not only academically but emotionally and socially. So what can you do? First, be honest with them and yourself. When I work with school-age children who stutter, I speak with them honestly and their families. I explain that I can teach them techniques and provide tools to modify their stutter and shape their stuttering into more fluent speech but that they will have to do the work. I provide them with facts including the fact that NO ONE is 100% fluent and that I want them to listen to others speak (including myself) and they will notice. Parent education is important too. The Stuttering Foundation of America has a wonderful handout for parents on talking to their kids at home and provides additional resources. Provide Knowledge. When student’s leave my speech room, I want them to feel empowered instead of deflated. So many students have told me that they are limited by their stuttering and so I always go over the Famous People Who Stutter and who did not let it limit them. This has also helped many of my kids see that they are not alone. Provide them knowledge on their speech machine and what is typical vs. non-typical disfluencies. Teach the use of Stuttering Modifications and Fluency Shaping Techniques in a variety of environments. Once student’s have the use of these tools in structures setting, take them out of this setting. Get out of your speech room. Take them to the school library, cafeteria, nurse’s office, school counselor, etc.. Change up the environments, the people they interact with, and the communication demands. I reach out and train parents on the use of these tools too. Again, I usually explain to parents that the idea is not to be 100% fluent but to provide the tools to shape the stuttering into more fluent speech. I ask parents to provide me with feedback when they go out into the community and reinforce letting their child speak for themselves using their tools. In other words, no ordering at restaurants, movies, or the library for their child. Providing the opportunity to practice using their tools in the “real world” helps them generalize using these tools in everyday opportunities. Treat the WHOLE Family. Providing families with education, resources, and tips to communicate can help the student tremendously! I have had families that were very receptive to the parent training and students made greater gains and became more confident quickly. Unfortunately, I have also had families that never became a partner in the process and many times I found that those student’s were less likely to invest in the process too. Family buy in is important because they only see us for a short amount of time, if families are involved it is more likely to help with generalization and make the work of using the tools more common place. The Stuttering Foundation of America – Great website with resources and handouts. 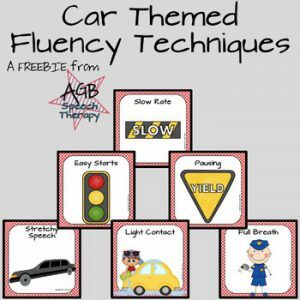 A freebie by Ashley B to introduce fluency techniques. 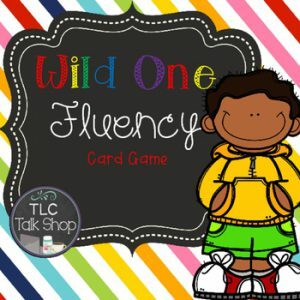 Are you Puzzled by Fluency? 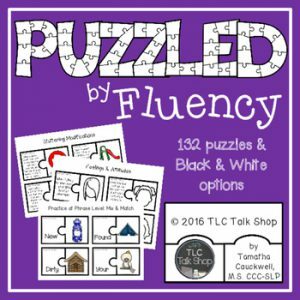 Here are 132 puzzles in color and black and white to address: type of disfluency definitions, fluency shaping and stuttering modification technique definitions, fears, feelings and attitudes, desensitization and problems solving social situations, and using strategies for the word, phrase, sentence, and narrative levels! A card game like Uno that targets: type of disfluency definitions, fluency shaping and stuttering modification technique definitions, fears, feelings and attitudes, desensitization and problems solving social situations, and using strategies for the word, phrase, and sentence level. The cards can be used in the game or in isolation for progress monitoring and data collection. We would love to hear from you! Do you have any tips or tricks when working on Stuttering Therapy?